A slice of paradise. So happy to stay here, would definitely stay again. The receptionist Gabriel was so helpful day or night. The decor of the whole hotel including the breakfast, restaurant/bar, and the beach lounge area is so cute, creative, and comfortable. Eye candy everywhere you look! Friendly and helpful staff. 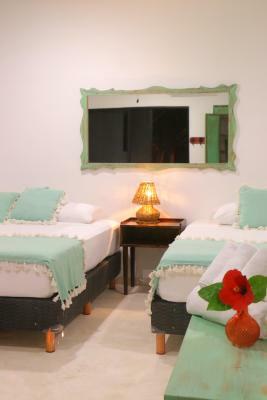 Big, air conditioned room with ocean view. Large balcony. 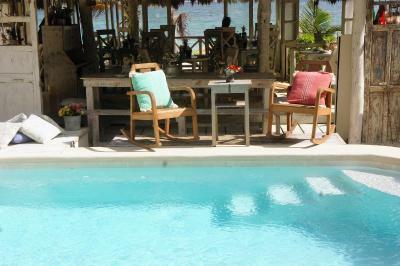 A primitive, beachy feel with a touch of luxury. 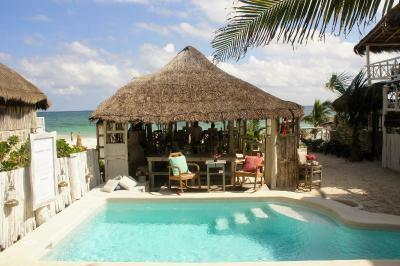 Had small pool and bar on private beach. Good location with other restaurants and shops. Breakfast was included. I like the location and the staff..this is my second stay and I will be returning at the end of November with my husband. 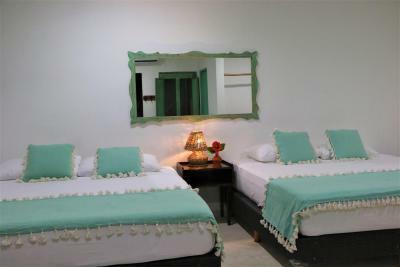 The hotel is very attractive and clean.The restaurant has a beautiful view of the beach/sea. Right on the beach.. breakfast was good, small beach but quiet and umbrellas, chairs, and drinks available. Great beachfront property Restaurant food and beach menu was very good Pool was great to have as an alternative and the gardens are lovely and well manicured. The property is well maintained and very central, good location. Bed and pillows were great. Nice thick cotton sheets. Very good housekeeping service daily. Love the private portico each place has outside. The location was awsome, because it is directly at the beach and there was also a lot of restaustaurants very close of this hotel. The location is great. It's a little stretch of the "hotel zone" with just enough hotels, shops, and restaurants. The hotel shares a great little beach with just a few hotels. 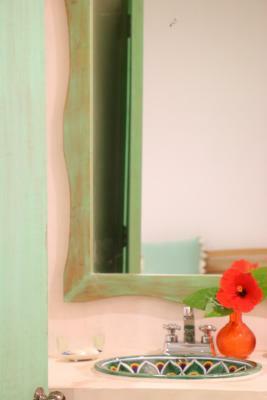 The hotel is very charming and decorated with taste. The restaurant is very pleasant and serves good food. The staff was very friendly, especially Corrado with whom we had great conversations and the night guard who showed us turtles. 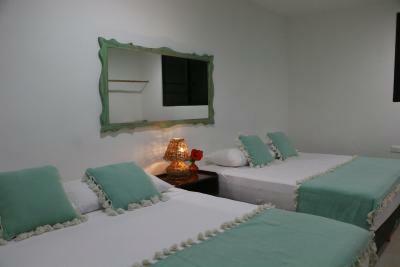 The hotel has a great atmosphere, spacious rooms and with excellent service and staff. Good for a couple looking to get away. didn't enjoy my stay and wouldn't recommend. Waitstaff at the restaurant was rude. 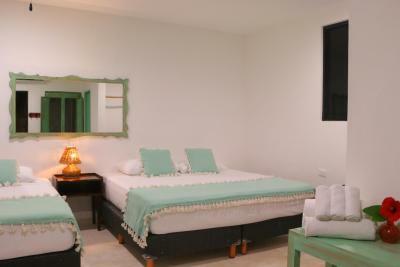 Very basic rooms. 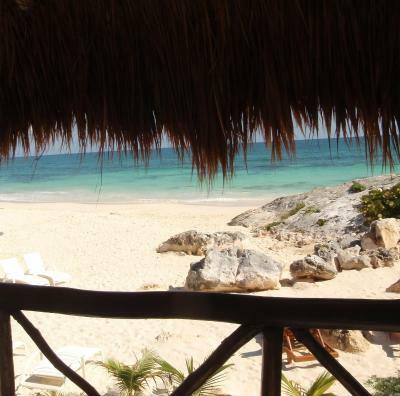 Punta Piedra Beach Posada This rating is a reflection of how the property compares to the industry standard when it comes to price, facilities and services available. It's based on a self-evaluation by the property. Use this rating to help choose your stay! 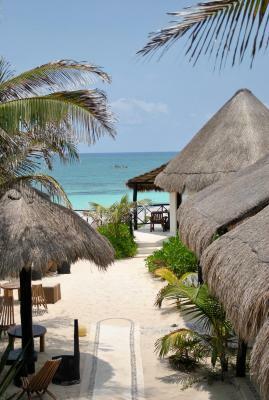 One of our top picks in Tulum.Located on a private beach within Tulum National Park, this tropical complex offers thatched cabins with sea views, free WiFi and private bathrooms. 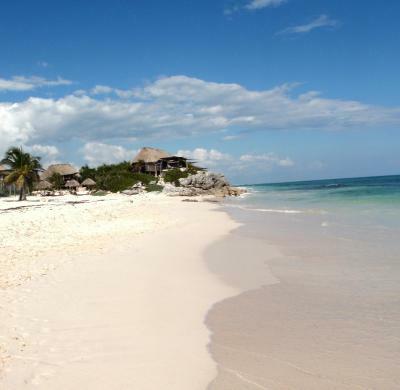 Tulum’s Mayan Ruins are just 2.5 mi away. 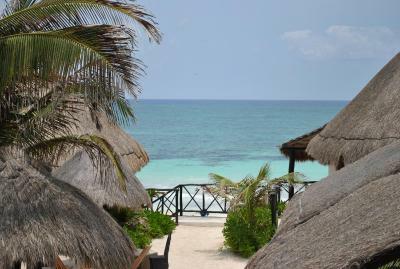 Punta Piedra Beach Posada offers cabins surrounded by palm trees and gardens. 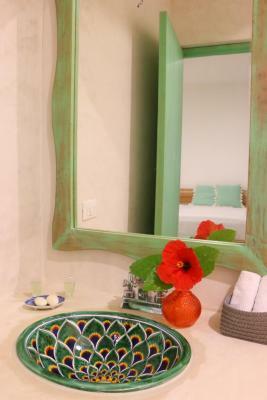 Each cabin has bright traditional décor and tiled floors. All include a safe, a fan and mosquito nets. This is an eco-friendly property that uses ecological sources of energy. Located on the beach, the Mivida restaurant specializes in tapas. 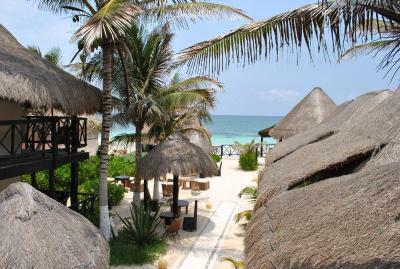 You can also find a range of restaurants and bars in Tulum town, a 10-minute drive away. 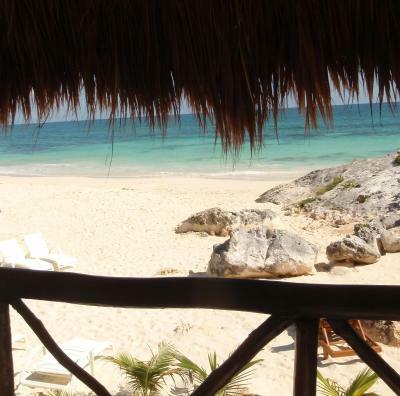 Punta Piedra Beach Posada’s 24-hour reception offers information about the region. Airport transfers are available on request, and car or bicycle rental can be arranged. 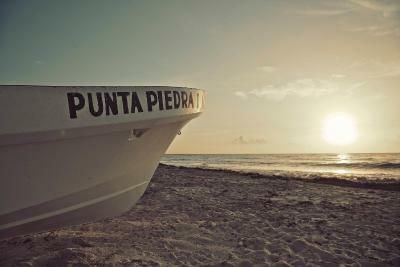 When would you like to stay at Punta Piedra Beach Posada? 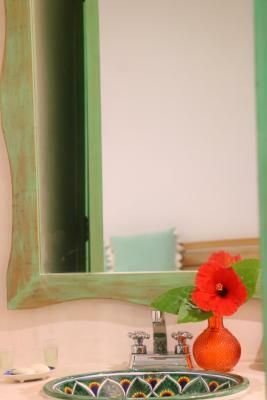 Small cottage with private bathroom offers free WiFi, hot water and simple decor. 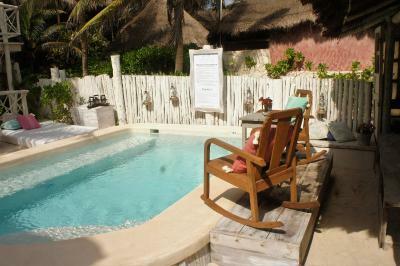 All rooms feature a Palapa roof and a small private patio divided by vegetation, where you can relax in hammocks or chairs, enjoy a good book or have breakfast in private . Ceiling fans, and contacts to charge computers or phones. Mosquito net is available upon request. Please note this room does not have a sea view. 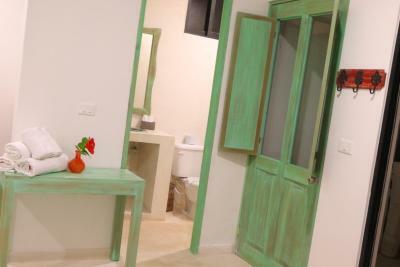 The organic and sustainable Cabins offer free WiFi, a private bathroom and private balcony. 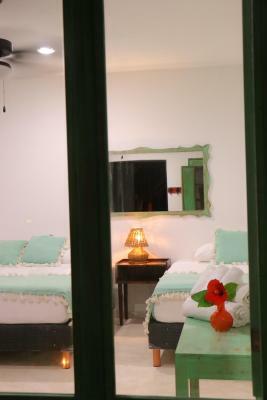 Traditionally decorated in bright colors, tiled floors, safe, fan and mosquito nets. 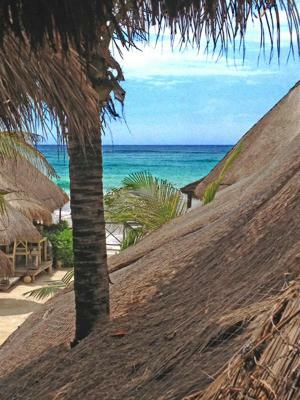 The rooms are located on the ground floor or on the 2nd floor and have thatched roofs. A free bottle of water per day is provided. This room has a pool and garden view, not a sea view. 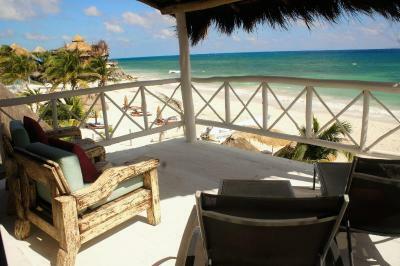 This spacious sustainable quadruple cabin has 2 king-size beds and offers free Wi-Fi, a palapa terrace with sea views and a private bathroom. 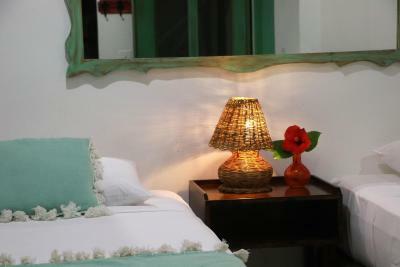 It has bright traditional décor with tiled floors, and includes a safe, a fan and mosquito nets. Sustainable cabins with eco decór offer two Queen Size beds, free WiFi, and a private bathroom. 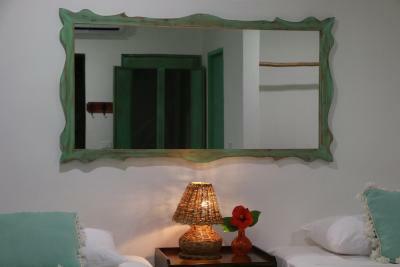 They have bright traditional décor and tiled floors, and include a safe, a fan and mosquito nets. Ceiling fans, and contacts to charge computers or phones. 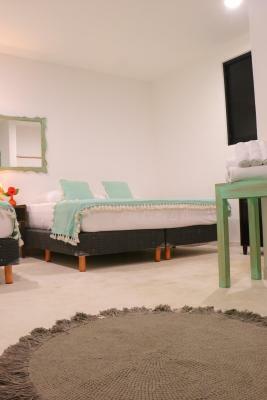 This spacious cabin offers free Wi-Fi, a balcony with garden and sea views and a private bathroom. 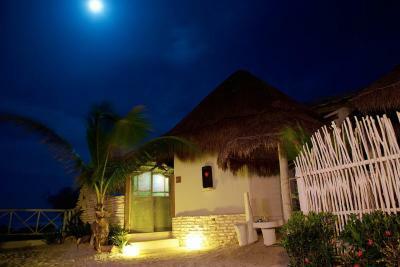 It has bright traditional décor with palapa roofs and tiled floors, and includes a safe, a fan and mosquito nets. Ceiling fans, and contacts to charge computers or phones. This room is not over the sea, it is 82 feet from the beach. It has beautiful views of the gardens and the beach, but is 82 feet away. This spacious quadruple cabin have 2 king-size beds and one sofa and offers free WiFi, a palapa terrace and a private bathroom. 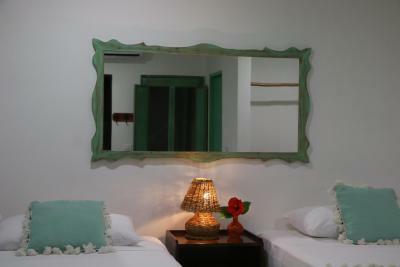 It has bright traditional décor with tiled floors, and includes a safe, a fan and mosquito nets. House Rules Punta Piedra Beach Posada takes special requests – add in the next step! Up to three children under 6 years are charged USD 30 per night when using existing beds. 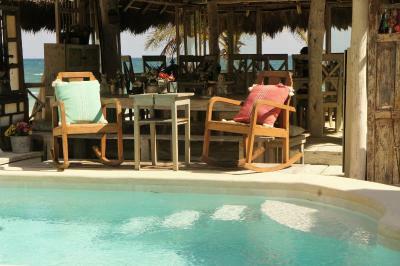 Punta Piedra Beach Posada accepts these cards and reserves the right to temporarily hold an amount prior to arrival. Please note that the use of wind generated energy will cause some noise in case of storms. Standard Rooms do not have a sea view. 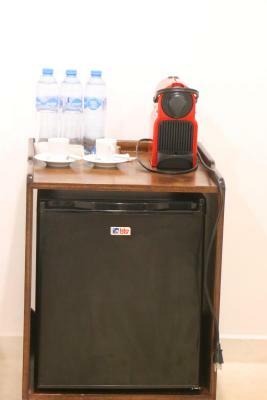 Complimentary breakfast includes coffee and tea as well as bread. The property will place a pre-authorization of the total amount including taxes. You can contact the property for more information. The Estimate time of cash back, depend of the Owner Bank of the Credit Card. The hotel does not have parking. 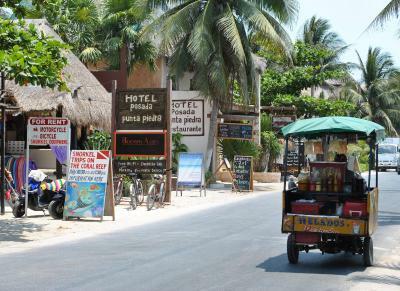 In the area you will find private parking for 10 usd per night, you can also park on the street. The private parking does not belong to the hotel. Hard to check in with car. Friendly staff. Nice breakfast. Very nice beds. Relaxed atmosphere. The worst is the loud music from early morning to late evening. This really destroys the atmosphere and does not allow to relax properly. Anyway, most of the people at the beach listen to their music with their earphones on, so its hard to understand why this loud music non-stop should be necessary. The room was very dark and with mold in the corners, the ventilation in the bathroom is insufficient and it is too loud from the kitchen. It is possible that this particular room is the worst one, but we asked for the alternatives and did not get one of the potentially better rooms. 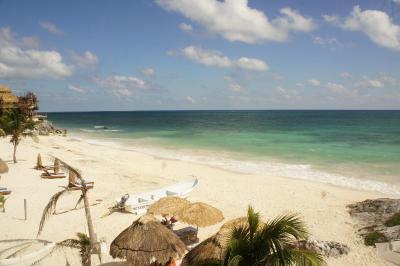 This is not our first time in Mexico, and all-in-all, the hotel did not meet our expectations. The best about this hotel is the restaurant. The chefs are geniuses, the cooking is a modern interpretation of Italian cuisine adapted to local products. We had a dinner, a breakfast and a lunch and one was even better than the other. In the hotel, the personnel was very friendly and the happy-hour cocktail was fantastic. 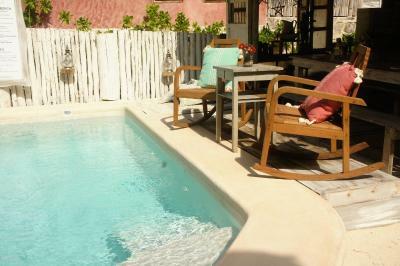 The location was fantastic and the staff were super friendly, lovely and accommodating. I was a bit uncomfortable temperature wise (either too hot or too cold...very muggy, then freezing when the A/C kicked in) in the first downstairs room my son and I had, but then we upgraded to a balcony second floor room and we were much more comfortable. The water temp in the first room was also too cold but the second room was perfect. Room (simple, clean, small but a decent size) was the first one right by the hallway as you enter the hotel area and it gets pretty loud throughout the day, by both guests and staff, as it also seems the custodial closet is nearby, as well. 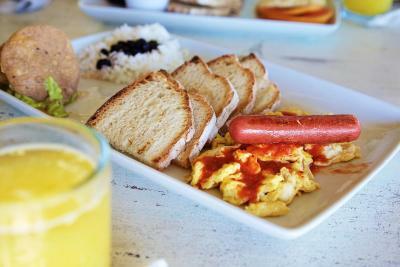 Breakfast was OK, though maybe don't order the "Mexican" breakfast (undercooked rice and bland beans) and instead, request the toast and fruit. They charged us extra for an extra person, although we insisted that she had an early flight and was just dropping her stuff in our room and not actually sleeping in it. Approached someone about our "Welcome drink," asking if we could drink it on the beach and they tried to tell us that it would cost us 300 mex, despite us being actual paying guests. Beach was crowded, loud and dirty -- tons of flies and sand buggies where, even after staying for nearly a week in Tulum already, we ended up getting devoured. Staff was very accommodating and friendly, helping us with our rental car situation and just pleasant to chat with. 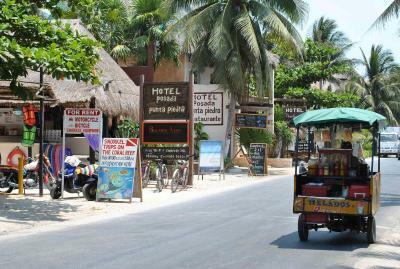 Loved that it was walking distance to some shops, Matteo's and the full moon party at Papaya Playa -- pretty much the reason why we booked here in the first place. The bathrooms are on the small side and a little basic/rough round the edges. Doesn’t effect your stay but shame they aren’t nicer. Every member of staff expect and ask for a tip! The property is in a great location on the beach front, sharing it’s beach with Azulik it is in a great spot. 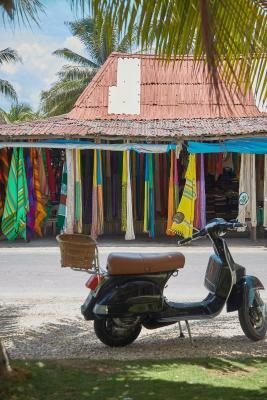 Some may prefer to stay at the other end of the beach but as there is a scooter rental shop next door it makes it ideal as a location and then exploring from there. 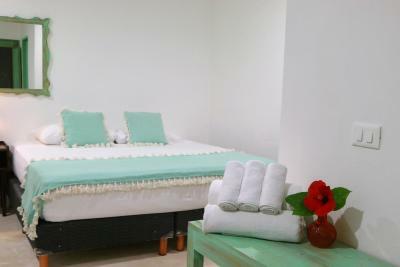 The housekeeping staff are great and ensure rooms are clean and cleared of sand each day. The room is very - very - small. There is no place to put the lugaje nor comfortably keep your clotes. In the WC the space between the seat and the wall si less than in an economy airline. Everithing surrounding the room is sand, so it is inevitabiliy to bring the sand in the room all over. But in contrast the service from the management is poor, rude and abusive. I tried to escalate and to talk with the person in charge of the hotel or withjh the General Manager but it was imposible. Instead I received a message that they were not interested to talk with me, and that I should complain trough Booking.com. They charge you for everithing no matter how dump it may be the idea. Just as an example, included on the free breakfast is a two eggs ommelete with ham and cheese. When I asked them to change it instead for scrambled eggs with ham and cheese they charged me the breakfast. It was so unconfortable the room space that I tried to cancel the last night to move into a better hotel closer to the airport. It was imposible to even try to request this. The answer for all requests was NO or with an additional charge. The hotel is not run by Mexicans at the management level, but for argentineans. 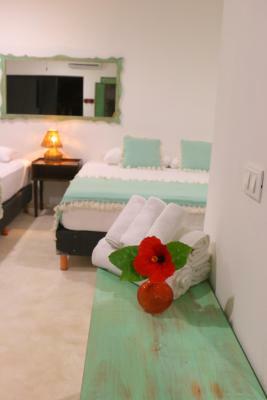 The cordiality and atention to make your self comfortable is not what you would normaly expect from a Mexican hotel. Addittionally, there is no security at the beach front and the place is used by some locals as a drinling place, so it makes it unsafe and noisy. 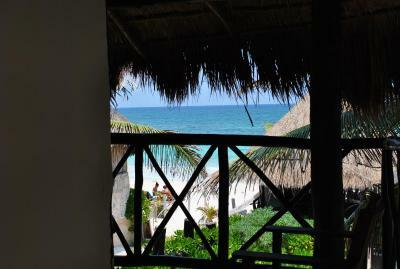 There is no barrier (a door or anything else) from the beach to the rooms area. 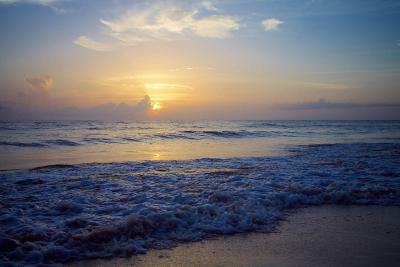 Forget about laying at the beach at night to hear the noise from the sea and see the stars. That is not relaxing at all. The service of the lady cleaning the room is excelent. She tries hard besides of the limitations in the room. She was the only one thing that was worth value to rescue. The restaurant is a little bit expensive. 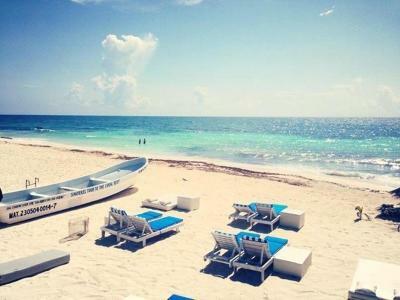 Very nice location on Tulum beach. 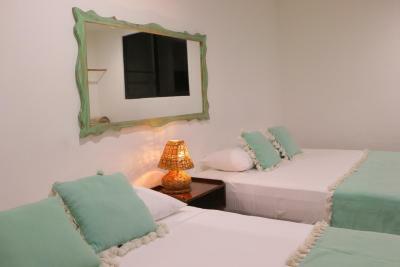 Very nice accommodation, very clean and comfortable. A bit overpriced as to what they offer. The toilet was leaking constantly which led to a puddle of water in front of the toilet seat, it was nasty and couldn’t apparently be fixed as we reported this but nothing happened. 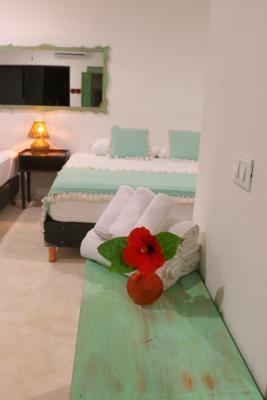 The rooms could be still improved to offer a better client experience, just with small things like another trashbin in the room, night lamps, a rack where to put your towel etc. Not much to do at night time unless you leave the hotel and find a restaurant. I think I had one of the best rooms. 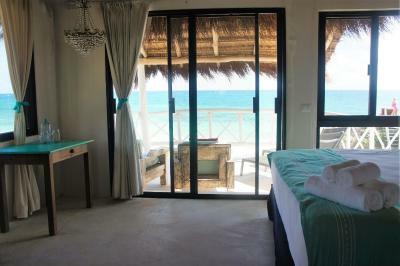 It had a partial ocean view, the balcony was amazing, and the room was a great size with two queen beds. 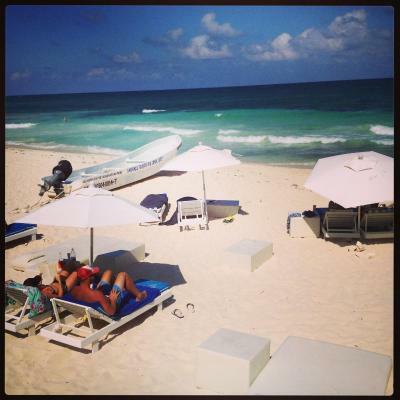 Loved everything about this hotel, from the staff, the beach and the beauty this place has. I think they ran out of homemade bread by 1000am and they gave me a white bread like wonder bread which i would never eat..that's more of a personal issue I think....However,in general, they might think about a higher quality product for a hotel such as theirs...also the toilet in room #3 is very close to the wall...a larger person would have to sit sideways to use it! Unfortunately for them,the seaweed has been a big problem this year along the entire coast so the beach/swimming was not so great..which is not their fault..although they could mitigate the problem by.having someone cleaning up the seaweed on a regular basis in years when the sargasso is bad would make the beach more inviting for guests...Thanks!